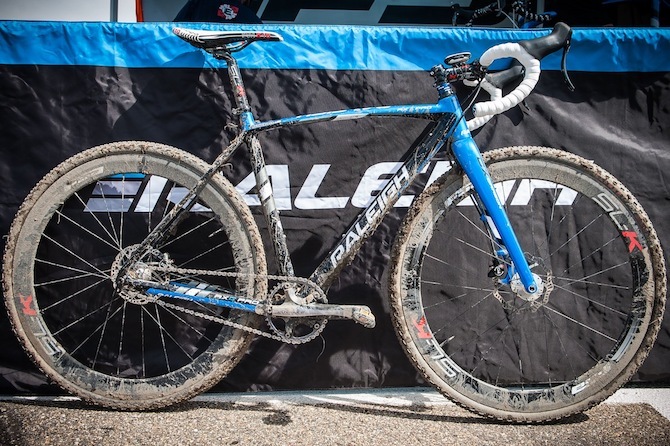 Raleigh cyclocross riders found podiums and embraced suffering during back-to-back UCI races over the weekend. On Saturday the U.S. Open of Cyclocross took the athletes through sand, corners, and straightaways along the shore of Boulder Reservoir. The Boulder Cup at Valmont Bike Park on Sunday featured repeated short climbs and descents. Caroline Mani’s rapid acceleration at the start of both events forced early selections. On both days she led the field for one to two laps. Her performance marked an improvement over the previous two years when she struggled to keep pace in the first lap. When U.S. National Champion Katie Compton surged into the lead on Saturday, Mani worked with a small chase group. Having decided she was “willing to lose to win,” with just over a lap remaining, she shot out of the group and held them off to claim second place. At the Boulder Cup she placed fourth. This season the previous French national cyclocross champion fights for more than her personal ambitions. 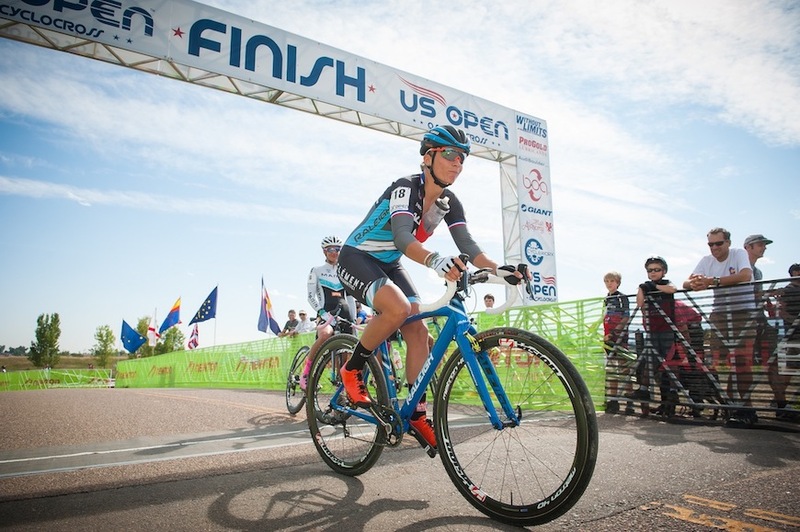 She mentors the Amy D. Foundation’s first scholarship recipient Erica Zaveta who competes in a blue and orange Amy D. Racing kit and will travel with the Raleigh-Clement team on the US circuit. 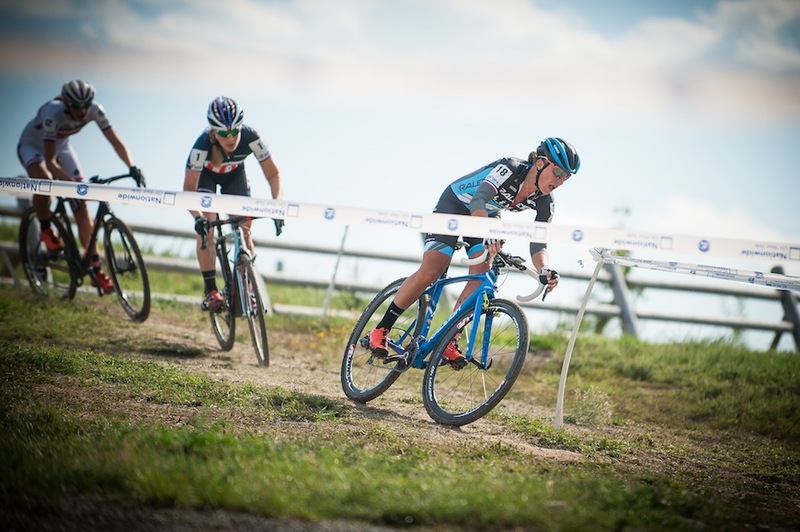 Coming off 9th place at CrossVegas and feeling challenged by racing at altitude, Zaveta finished a solid 12th and 11th in Boulder fields stacked with American and international talent. Raleigh-Clement men Ben Berden and Jamey Driscoll returned to the Rocky Mountain venues with a history of strong results. Berden finished a solid second on Saturday despite fatigue that lingered from a busy stretch at the Vegas race and Interbike. “I need a recovery week,” he said at the reservoir. “I just could follow wheels. If I came to the front, I wasn’t fast enough to open a gap.” He started fast Sunday at Valmont Bike Park, but in the second lap he crashed hard on a descent, injuring his neck and back, and breaking his derailleur. With a new bike he passed multiple riders and finished 10th. At both races Driscoll labored hard on his own just behind the leaders, placing a solid 4th on Saturday and 5th on Sunday. “I was going hard the entire race, but that last lap I definitely had the sugar low,” he explained after the Boulder Cup. Driscoll thinks he may have scaled back his preparation for the season too much in order to avoid going in over-trained like last year, but feels he can race into shape. Gaffney concurred, saying the bike is the best he’s ever ridden. He finished in the top sixteen at both Boulder races. The Valmont Bike Park venue carries special meaning for him. In January he became collegiate division II national cyclocross champion there. Remembering that win infused him with extra confidence on Sunday.